​1. "Boy, you have a lot of people here. The press will say it's about 200 people. It looks like about 45,000 people. You set a record today. You set a record." The Charleston Gazette estimated 40,000 people in the crowd -- which is a lot! Not sure there is a "record" for attendance at a Boy Scout Jamboree. Also worth noting from the Gazette: "Press staff handling the event did not allow local media to bring film equipment into the amphitheater." 2. "I said, 'Who the hell wants to speak about politics when I'm in front of the Boy Scouts?' Right?" Trump, apparently. He spent the VAST majority of this speech jabbing at his political foes and recounting his 2016 successes. 3. "Today, I said we ought to change it from the word 'swamp' to the word 'cesspool' or, perhaps, to the word 'sewer.'" 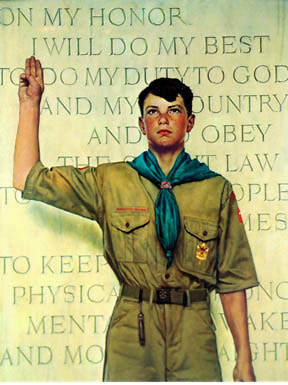 Remember: "Who the hell wants to speak about politics when I'm in front of the Boy Scouts?" 4. "Many of my top advisers in the White House were Scouts. Ten members of my Cabinet were Scouts. Can you believe that? Ten." One of them is Eagle Scout and Attorney General Jeff Sessions, who Trump neither brought along on the trip or mentioned in his speech. 5. "Some of you here tonight might even have camped out in this yard when Mike was the governor of Indiana, but the scouting was very, very important." 6. "We're doing a lot with energy." This was part of Trump's introduction of Boy Scout and Energy Secretary Rick Perry, who was in attendance. Apparently, we are "doing a lot" with energy. 7. "He better get them. Oh, he better -- otherwise, I'll say, 'Tom, you're fired.' I'll get somebody." This "joke" was directed at Health and Human Services Secretary Tom Price who was, awkwardly, standing on stage next to Trump. It came amid Trump's public effort to force Sessions to resign and less than a week after Trump threatened Sen. Dean Heller, R-Nevada, on health care. 8. "As the Scout Law says: 'A Scout is trustworthy, loyal' -- we could use some more loyalty, I will tell you that." Is this about Sessions? Republicans in the Senate on health care? Staffers leaking to reporters? All of the above? 9. "I'm waving to people back there so small I can't even see them. Man, this is a lot of people." This has to be a record, right? 10. "By the way, what do you think the chances are that this incredible, massive crowd, record-setting is going to be shown on television tonight? One percent or zero?" As Trump was saying this, CNN was showing shots of the crowd. Also, that crowd was "massive" and "record setting." 11. "By the way, just a question, did President Obama ever come to a jamboree?" "Who the hell wants to speak about politics when I'm in front of the Boy Scouts?" 12. "I'll tell you a story that's very interesting for me when I was young. There was a man named William Levitt -- Levittowns, you have some here, you have some in different states." This is my favorite part of the entire Trump speech. He regales a crowd of kids -- most of whom are teenagers -- about life in New York in the post-World War II age. Nothing like knowing your audience! 13. "Oh, you're Boy Scouts, but you know life. You know life. So -- look at you." 14. "He so badly wanted it, he got bored with this life of yachts and sailing and all of the things he did in the south of France and other places." 15. "And in the end he failed, and he failed badly. Lost all of his money." Aim for the stars, kids! 16. "I saw him at a cocktail party, and it was very sad because the hottest people in New York were at this party." Again, Trump is speaking to a crowd of teenagers. And recounting his glory days in New York City high society -- decades before they were even born. 17. "You have to know whether or not you continue to have the momentum, and if you don't have it, that's OK. Because you're going to go on and you're going to learn and you're going to do things that are great." Momentum is the key. Having it is everything. If you don't have it, though, everything is still going to be great. 18. "I have to tell you our economy is doing great." For the 80th time: Trump is speaking to tens of thousands of teenagers. 19. "Do we remember that date? Was that a beautiful date? What a date." He's talking about Election Day 2016. Because of course he is. 20. "But do you remember that incredible night with the maps and the Republicans are red and the Democrats are blue, and that map was so red, it was unbelievable, and they didn't know what to say?" ICYMI: Donald Trump won the 2016 election, winning 304 out of a possible 538 electoral votes. That election was 260 days ago. 21. "And you know we have a tremendous disadvantage in the Electoral College -- popular vote is much easier." 22. "I went to Maine four times because it's one vote, and we won. But we won -- one vote. I went there because I kept hearing we're at 269." He's speaking to teenagers gathered for their annual Jamboree in West Virginia. And he's talking about how Maine splits its two electoral votes by congressional district. 23. "But then Wisconsin came in. Many, many years -- Michigan came in." 24. "Wisconsin hadn't been won in many, many years by a Republican. But we go to Wisconsin, and we had tremendous crowds. And I'd leave these massive crowds. I'd say, 'Why are we going to lose this state?'" Not sure if you've heard but Trump won Wisconsin. He was the first Republican presidential candidate to win the state since Ronald Reagan in 1984. 25. "So I have to tell you what we did, in all fairness, is an unbelievable tribute to you and all of the other millions and millions of people that came out and voted for Make America Great Again." Most of the people who were in the audience weren't 18 in 2016 and, therefore, did not vote to Make America Great Again. 26. "And by the way, under the Trump administration, you'll be saying 'Merry Christmas' again when you go shopping. Believe me. 'Merry Christmas.'" Trump gave this speech on July 24. 27. "They've been downplaying that little, beautiful phrase. You're going to be saying 'Merry Christmas' again, folks." First of all, "they." Second of all, Merry damn Christmas. 28. "I promise you that you will live scouting's adventure every single day of your life, and you will win, win, win and help people in doing so." So much winning. You will be bored by all of the winning. 29. "I've known so many great people." The best people. Believe me.